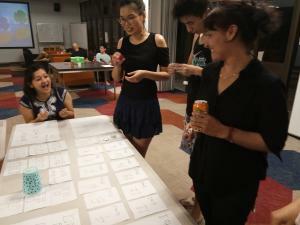 Saturday night, 2 September, the International Events Committee successfully held their second cultural event for the semester. The event did not focus on cultural food – although some finger food and drinks were provided – but more so on an international location. Macau is widely known as the preeminent gambling capital of the world, greatly dwarfing other gambling centers. “A Night in Macau” gave residents a wonderful experience of Macau’s culture and this marvellous event attracted around 30 residents to gamble and experience the atmosphere of Macau. Eight other residents helped during the preparation and worked as dealers throughout the night. We started the night by providing each resident $200 worth of chips for themselves to choose what game they want to play. 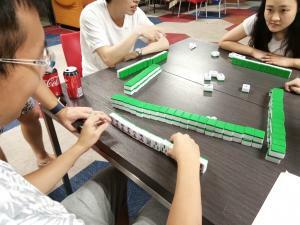 The gambling game included Black Jack, Mah-jong, Dice and Sic Bo. After every half an hour, they can collect another $50 worth of chips until 10pm – to make sure all their money wasn’t lost in the first two games! 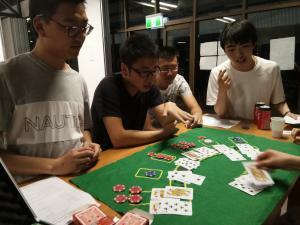 Being the easiest to play, the Dice game attracted the most residents among all the games, followed by Black Jack. “This event was awesome and I love Dice game the most because I won a lot in that game!” said Niki. Duc Hung won the first prize, Niki won second prize and Simarjit won third. Each of them received gift cards at various values. Thank you to those dealers who assisted us with the room set-up, preparation and residents who participate in the event, we would not have been able to run this event successfully without them. - Stephanie, International Events Committee.